Hey Everyone! 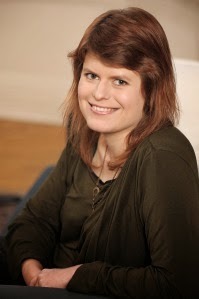 Today, I'm excited to be the next stop on the EARTH & SKY CANADA BLOG TOUR, to celebrate Megan Crewe's upcoming release of her BRAND NEW YA Sci-fi series! Add Earth and Sky to your Goodreads list here. Earth and Sky is a perfect YA Sci-fi read for reluctant Sci-fi readers! Megan has created a unique spin on the Sci-fi genre, with some unexpected twists and turns. The actions continues through Earth and Sky, from beginning to end, that will keep the reader engaged throughout and saying "Just one more chapter". Skylar is the heroine of the story and does a great job narrating. She's an interesting and relatable character in the sense that, she always feels outcasted from her peers, but would love nothing more than to fit in. Ever since she can remember, she's constantly finding herself overcome with feelings of unease (something's just not right) at the most inopportune times, and over the years has developed OCD rituals to relieve her anxiety. As I stated above, Earth and Sky has a very action-driven plot, but we are also introduced to many different and interesting characters (which I hope we'll get to see more of in book 2!). There is some family heartache as well in this first book, one scene in particular with Skylar's older brother, that truly breaks your heart. There's lots of time travel in this book, which was exciting, and as is the case with me when I often read sci-fi, I got a bit confused with the explanations of various time travel consequences, but my confusion in no way took from my enjoyment of Crewe's latest work. It was refreshing to read a YA relationship in which both main characters aren't declaring their love for each other two chapters in, haha. No, Crewe does a great job at pacing the development between Sky and Win and I look forward to seeing where Crewe will take these in her next instalment. The ending was perfect, it leaves the reader wanting the next instalment, but ultimately satisfied with the state of affairs up to that point. 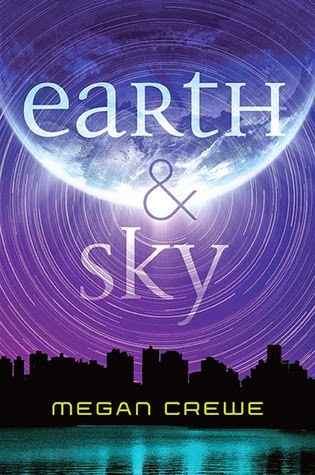 If you enjoy Sci-fi in your YA, or even if your reluctant with this genre, I recommend giving Earth and Sky and try (wasn't even trying to rhyme there :)) it's a quick, action-packed read, with a blossoming romance. Please join me in welcoming Megan to the blog today!!! -SF expands the horizons of fiction, often taking readers right out of this world, off into the rest of the universe. Not that there's anything wrong with stories set on Earth, but it's fascinating to speculate about what we might find beyond our planet and our solar system. -SF encourages us to consider the paths elements in our current lives might lead us on. How might our laws have shifted in a hundred years if they continue in the same direction they are now? Will we become even more influenced by advertising and propaganda as marketing strategies become more refined? What will friendships and romantic relationships look like in a world where people connect as much through the internet as in-person meetings? And so on. It can be easy to take what we have right now for granted, and I appreciate being challenged to look at the possible consequences of the decisions we're making. -SF gets readers thinking about the future in general. I think sometimes we can get too short-sighted about life, only worrying about our immediate concerns and goals. A reminder that the long-view is important too, and that it matters what the world and our lives will look like decades from now, can't be a bad thing. -SF allows us to take off on imaginative and fantastic adventures often far beyond the bounds of our current reality… but that are still--more or less, depending on the story, but always at least a little--based on what might be scientifically possible, rather than being completely made up. As much as I enjoy outright fantasy, there's something particularly exciting about a story that gives me an otherworldly experience that I know isn't entirely impossible. I'd be curious to hear what other readers especially enjoy about science fiction! Be sure to stop other host stops on the blog tour for reviews, Author Q&As and more! Special thanks to Megan Crewe and Razorbill Canada for allowing me to participate in this tour!